Seven years ago (pre-kids), Dave and I loved taking the bus around the city on Friday nights. We would pack a greyhound roadie, hoodies and a camera, then take the bus from our Marina apartment through the city to a dive bar in another 'hood. We have a giant magnetic chalkboard that has been a staple in our various apartments for the last ten years, and we'd print our street photos in various sizes and pin them up by a magnet to the chalkboard. When friends came over, they were welcome to take photos home with them. It felt good to share the images we created and it also forced us to produce more images to replace the ever-changing art landscape of this chalkboard. Fast-forward seven years when it costs $100 to have a babysitter for four or five hours out on the town and we simply haven't invested in this type of night since becoming parents. We've wanted to...we've talked about it...but it just seemed so frivolous to spend that kind of money on a night of doing "nothing". Last night we found ourselves having a babysitter but no plans. With just a month left in SF until we move to Raleigh, we each brought our cameras with us, packed a roadie and our hoodies, and off we went. The results? Ummm, rusty. At best. You'd think that since I shoot for a living, I'd easily swoop into this freedom of shooting anything and everything my eyes see, without regard to what a client may want to see. And yet, I found myself frozen. I was full of self-doubts of what would make an interesting photo, hesitating to click the shutter for fear of not creating anything amazing. What I learned from last night is: it's time to get weird. It's time to start shooting for the fun of shooting and not for the known outcome. You see with families, it's a known outcome. Toddlers, throw your best tantrums: I got this. Newborns, just try not to fall asleep: I'm clever with a swaddle wrap. I can tell a family's story and bring out their very best each and every time. That is the difference between an amateur and a pro. An amateur can get a great shot or two on any given day, but a pro MUST produce that same result regardless of the day. Yet here I found myself with a night of freedom in San Francisco and realized I am an amateur once again. More to follow, but I am EXCITED to explore this side of my creativity more. To shoot for the fun of it and to shoot for ME. As of May 29th, we are moving! Per my newsletter, I will be flying back quarterly starting with September for Fall Mini-Sessions, but there is no doubt the bi-coastal business will be different once we move. I want to start off by thanking you for inviting me to be a part of your families over the last seven years. It has been an honor to document each and every one of your children -- whether from the time they were in your bellies or their first week of life or when they took their first steps -- I am overwhelmed with how you've welcomed me to be there for all of your family's big moments. As I look back at my own big moments in the last 9 years of living in SF, I am grateful for each and every tribe that has brought me to where I am today. From our original MSH (aka "Making $hit Happen") Crew pre-kids who pushed me to start this very business -- to my first mom's group who held my hand (and my tears) as I navigated breastfeeding, sleep training and so much more -- to my JCC preschool mamas who supported my transition into being a working mama and all that entails -- I. am. grateful. There are many reasons for this move, but most of all it is about family. I've never understood why anyone would need anything more than what this great city has to offer. And now, 9 years later, I realize it's not that I'm seeking more, I'm seeking different. I'm seeking a life for my kids where we slow down. Where they spend their summer days lounging at the pool and their nights catching fireflies. I'm seeking the privilege of helping my parents grow through their sunset years with grace, and being there for them when they need me without having to book a flight to do so. And finally, I'm seeking the joy of knowing my niece and nephew...not "Ella-likes-chocolate" knowing, but really knowing her in ways I can't yet imagine. And please -- come visit anytime. We may even have a guest bedroom to offer (that isn't an air mattress on Cal's floor). Sending much, much love to you, SF. This shoot was one I had in my mind since February 2015. And it was finally executed in August 2015 with all elements in place!!! This series of photos made up our family's holiday card shoot this year and I've had several questions as to how we got a bed onto Crissy Field. NOTE: All family photos were taken by my fantastic sidekick, Sarah Arimura. Follow her here! Yes, it was a total pain in the rear end! Yes, I had permission from the Presidio Trust/people that give out photo permits. No, I couldn't do it alone (Sarah was a HUGE help in bringing this together!). 1) Buy a bedframe on CraigsList: $80.00 (used) - 2 hours (after several people flaking out for the sale) I chose the Leirvik because it was fairly non-descript but white. 2) Put together frame in garage to see how many pieces were missing (several) and then time yourself to see how long it takes you to put it together. : $0 - 3 hours Then take it apart again (because, unless you have a giant pick-up truck, this ain't gonna fit in your trunk!). 3) Purchase 3 bags of 14g of "turkey flats" (i.e. feathers): $19.00 - 30 minutes I used these as the inside of the pillows so we could have a true feather pillow fight. They were surprisingly easy to pick up off the ground after! 4) Procure & test double/queen air mattress: $0 - 30 minutes We happened to have an old one in the garage that had a hole in it, but would stay "up" for about 30mins at a time, which was perfect for our purposes! 5) Procure white sheets and LOTS of pillows: $0 - 30 minutes Our friend happens to have all white bedding and was generous enough to lend it all to us for the shoot. NOTE: If you borrow from someone, be fully ready to have to dry clean or replace their items if mud/grass/kids mess them up!!! So after buying the bed, putting it together and taking it apart in our garage, my assistant Sarah and her husband then hauled the bed and air mattress to Crissy Field and put everything together (blowing the air mattress up at Sports Basement). When I arrived, I had a particular vision of where the bed should be so that the photo was framed by the Golden Gate Bridge perfectly. I then walked her through what I had in mind and she shot the entire series of family shots. When that was complete, I photographed the kids myself and the compilation of those two sets of photos together were what made up our session! The entire session took 25 minutes and materials cost about $100. The planning, purchasing, set-up, break-down, editing, etc took approximately 7 hours. Using a camera and all of its "accoutrements": Okay, "using" is an understatement...a professional should know every knob, dial, measurement, and mathematical calculation that is associated with every photo they take...but let's keep it simple for now. Creativity: It's not a skill that is easily described or easily learned, and it's not something that is tangible...it just is. It's what I feel when I unlock that special "thing" that makes a kid light up in front of the camera. It's looking at every street, bench, building, and grassy path and allowing my curiosity to evolve as to how it would photograph with a family in it/on it/running down it. I mention it because it is a skill every good family photographer must have to create and capture moments between their subjects that bring out their natural expressions. Yes, there are about a hundred other skills that are helpful in being a photographer, but one may argue not necessary (i.e. developing photos...some would argue this is a necessity while others would argue you can outsource the entire process). My job, at the end of the day, is to bottle up love between my subjects into a photograph that will tell their story...in a moment...and for a lifetime. I photographed one of my favorite families from San Jose last week in Golden Gate Park. This is our fifth shoot together so by now we know each other quite well and it's really fun and easy-going. As I was editing their photos, I found myself GRINNING EAR TO EAR. Now, don't get me wrong...I truly adore my clients. I have special connections with each of them that makes us gel. I want to use this family in particular because a) I know mom is okay with it and b) they are awesome. Sometimes when families hire me for the first time, they come with some specific requests. They vary from simple asks ("a shot with all four of us together") to the more complicated ("the kids looking at the camera while jumping off a rock and holding hands and the dog sitting nicely on the side also looking at the camera"...uhhhhh). Now let me back up...I GET IT. The parent (typically the mom) has done SO MUCH WORK to get the family to this point. She has found a photographer...scheduled a date that melds for work, school, etc...coordinated everyone's outfits AND negotiated with the kids to put ON the aforementioned outfits...and of course she also already invested a decent chunk of money "sight unseen" for the session. So yes, I know there is pressure. Similar to when I go to my accountant, I don't look over his/her shoulder and micromanage them doing my taxes. I don't ask my dentist if he/she is sure she got that last tooth sparkling clean. I let the people I hire in my life DO THEIR THANG. Does that mean they are perfect and never make mistakes? Of course not. But, for the most part, my job was complete when I chose individuals that will serve our family because I trust them. For photography, not only do we need to get the logistics checked off (pic of family together looking at camera? check. ), but we need to be able to do that while creating an environment that is relaxed and fun so the kids don't realize one iota of the pressure the parents are feeling. And when parents do that - let go and let me do my thing? Now there is space for magic to be created. So here is my plea, parents. Talk to your photographer in advance about your concerns/requests/etc (that is what our pre-session phone consultation is for - use it!). There is nothing wrong with having an ideal shot list that you share - after all, I am a service provider here to serve YOU. But then - let go. Trust that your photographer has your wishes in his/her head and heart, and will do everything humanly possible to get you everything you need and then some. And my second plea? Remember these kids are...well...kids. If they are told to sit in a specific spot and "say cheese", they will do exactly that. But you'll have an image captured that isn't "your" kid at all...it is just a cardboard version of the adorable, active, personality-filled being that you know and love. 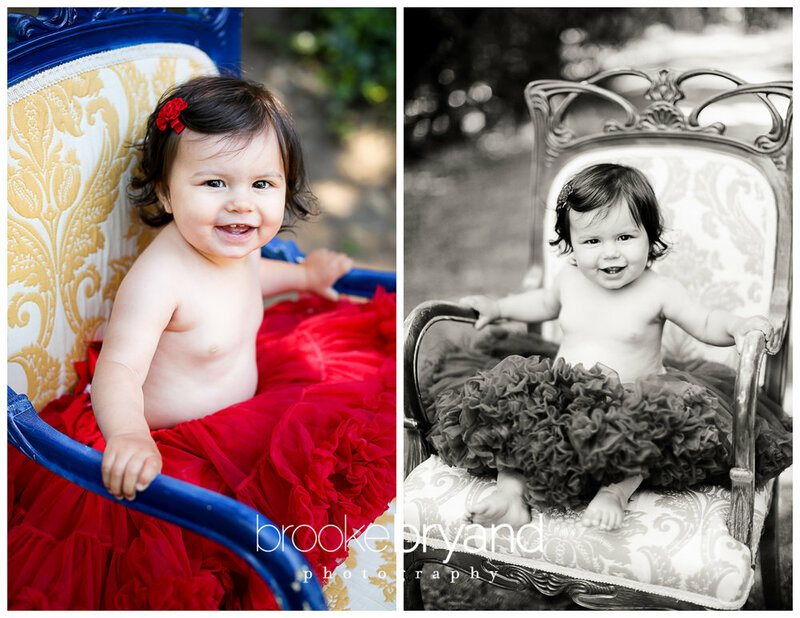 Thank you, BBP Families...for trusting me to capture the best versions of your selves. The crazy, the fun, the love, and the sincerity of the moments that your family shares. If you live in the San Francisco Bay Area, and especially if you're a female, it's likely you've heard of the mega-popular Stella & Dot Jewelry Line. Their format is that Stylists (such as the amazing Deirdre), help host Trunk Shows at people's homes or - in my case - studios. Hostesses (people like me) receive jewelry credit based on the amount of sales that occur at the Trunk Show. * We integrated complimentary headshots this year for anyone who could arrive before the sun set. I LOVED being able to pamper my fellow mamas, even if only for a few minutes, to make them get the royal rock star treatment they deserve. Future blog post coming with some of their headshots! As much as I abhor the anxiety I feel prior to hosting an event (oh...I didn't mention that? Uh, yeah...cold sweats, nerves, the works), I absolutely love having a room full of people that I love and care for in one space. And just as important...in my space. So often my encounters with both friends and clients is sporadic as we chase our kids or as I snap from behind my camera. It's rare that I get to actually just hang out and not be in charge of anything other than keeping their wine glasses full (my Southern Mama taught me well!) and that part is such a pleasure. So let's raise a glass to celebrating getting together...in person...with friends and loved ones. You can expect more events at the studio (ahem...holiday card night, anyone???) and - as always - thank you for supporting me do what I love! * I also love supporting a great cause (this year was Holy Family Day Home in San Francisco), where I will donate the full amount of "hostess gifts" to their organization. For example, if I earn $500 Stella & Dot Dollars from our Trunk Show, I will still need to spend those $500 through jewelry at Stella & Dot, but I will write a check to Holy Family for the amount of the hostess credits. It's a slight work-around, but at the end of the day gets the same job done to get money to a good cause. Sharing this "how-to" in case others are interested in doing it the same way! 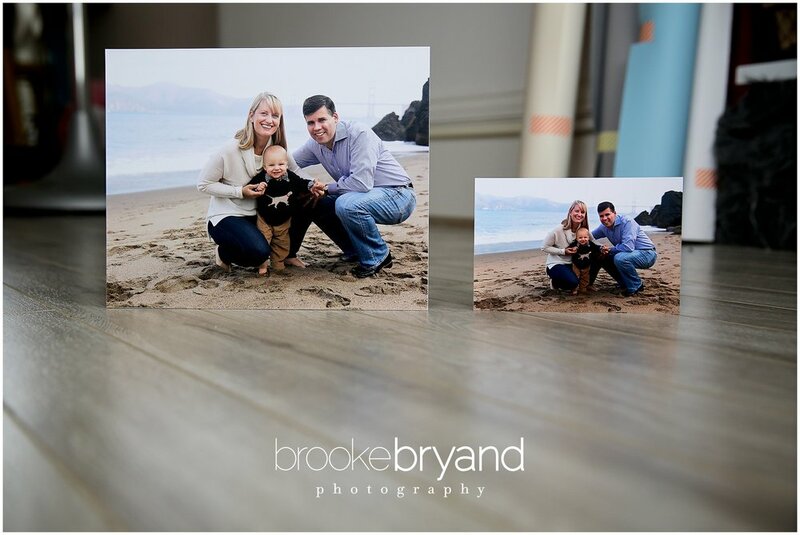 Happy Holidays from Brooke Bryand Photography! Stop what you're doing and make...this...cocktail! INSTRUCTIONS Combine the ciders, ginger beer, whiskey, lemon juice, and bitters in a large punch bowl or pitcher. Stir to combine. Top with orange slices and cinnamon sticks. Ladle into ice-filled punch glasses. Yes, I have left my family at home and I am hiding out. In my own city. Let me back up. Every year, my busy season is August to December. (Knock on wood), I know it's coming. I plan for it with additional childcare, additional dates with my husband, additional 1:1 time with my kiddos. This year, I cut out Sundays to avoid burnout...I have the studio where I can work peacefully...I have a magical man named Razaur who helps me with aspects of editing. The gist is - I had a plan. And yet, I am hiding out in a hotel room. Last Wednesday, I was at my friend Shari's for our weekly "Wine Wednesday" (playdate for the kiddos, playdate for us mommies). I warned her that I may cry. You know when you feel it building inside, and you just don't know what exactly will set it off? Yep, I was there. I typically cry about twice a year. Seriously - not a cryer. My college roommates would joke that I had the heart of steel because I wouldn't crack even when we watched tearjerkers. Anyways, I know that my trigger is stress. And with 30 galleries all due (ahem, overdue), my son's 5th birthday and birthday party, my sister and family arriving on Friday and Thanksgiving next week, I had hit my stress limit. I held in those tears until Sunday when I laid down out of sheer exhaustion but instead of sleeping, I started sobbing. And sobbing. And sobbing. I went upstairs to my friend Erin (who has seen me in this state before and knows how to "handle" me!) and she just held me, let me babble every one of my stresses to her, and let me cry (and cry). Once I semi-composed myself, she asked - if we were in a fantasy world where anything is possible, what would make this situation better? I shook my head. I didn't want any of her hippy-dippy-whatif-scenarios. I wanted a solution. I sarcastically responded that having 5 days kid-free by myself would resolve this situation (which is equivalent to saying you'd like to have lunch on the moon in my world). Five days where I could just edit uninterrupted, in my PJs, in the quiet. THEN, I would be healed. And then it was silent. She nodded her head in an understanding manner, and just let me soak it up for a few moments. After a pause, she simply suggested we explore it. I rolled my eyes. She asked what it would take, logistically, for this to come true...even if it's a variation (1 night away...2 nights away...etc). I started pouring out the reasons it wouldn't work (I have 3 shoots Monday and Tuesday...I have responsibility to the kids...my mom is in town). And then, the most magical thing happened. She created solutions. We walked through the week and filled in the holes. She would take the kids in the evenings. My mom would fill in during the days. Erin would take Cal to swim lessons. I already have childcare for the other days. I took a breath. And for the first time in hours...days...perhaps weeks...there was light at the end of the tunnel. THIS COULD WORK! So I packed my bags on Sunday night, and left for a hotel on Monday morning. Since arriving, I have rarely gotten out of my PJs and I couldn't be happier. Why am I sharing all of this with you? Not for pity - we all feel overwhelmed with various aspects of our lives at various times. Mine is always during busy season. In fact, after I finished doing the "ugly cry" with Erin, she smiled and said, "Hey! Look at the bright side - you made it to NOVEMBER this year before melting down...I'd call this progress!" I am sharing this because I see my mama clients when they are overwhelmed. I see them when they are about to hit their breaking point. I see their crestfallen faces when their toddler completely melts down and we haven't even started shooting yet. I see you, mamas. And I get it. I am sharing this to remind us to take a deep breath...to remember that when we plan something (whether it be the perfect work-life-plan or the perfect family photograph), the final result may be better than our plan ever could have been, if we will just let go enough to let it unfold. I am typing this from Hotel Rex in downtown San Francisco. I am in my PJs, listening to music and editing my heart out. I can see the light at the end of the tunnel and I am happy. Those tears ultimately led me to improving my business for next year. I will cut off family sessions on October 31st so families are not racing against holiday card deadlines. I will plan for a 5 day workcation the first week of November. I will allocate the time to enjoy the holidays with my friends, family and clients, so I can attend events rather than hide out editing late into the night. I realized the tears didn't set me off...the tears set me free. Many people ask how I get a baby's skin so smooth and also how I remove the blemishes from baby acne. There are people out there who have entire occupations doing just this, so I am by no means an expert. I am a photographer first, an editor second (or possibly third or fourth...point being, I try to leave certain aspects of my business to the pro's and this is one of them!). 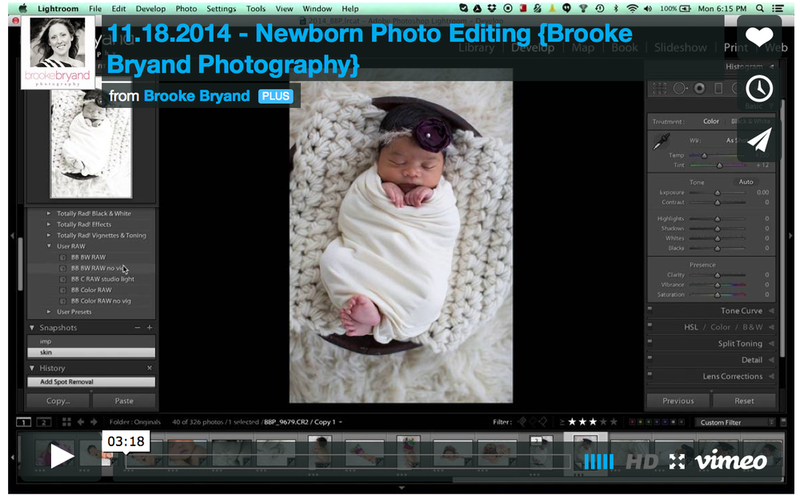 However, I do typically edit my own newborn shoots and wanted to show a brief video on how I edit just one image. I use Adobe Lightroom as my software and I shoot in RAW. Now every novice photographer does not need to invest in fancy (yet awesome) software...it is great, but it is not magic. Invest first in your skills, then your gear, then your post-production (i.e. software). Let me know if you have questions - I am happy to answer! I am often asked in mentoring sessions whether I give my best friends a discount or charge them at all. Yes, I charge them full price. Every cent of it. It's not because I'm stingy. It's not because I'm trying to prove a point. It's because I know it ultimately helps both of us for a long-term relationship. Let me back up. When I first started out, I was building my portfolio and learning all about the ins-and-outs of family photography. I had a handful of very good friends who helped me along the way (either letting me test out a concept on their family or just patiently allowing me to bounce ideas off them when they probably wished we were talking about breastfeeding or other baby-centric topics!). Then, fast-forward a few years. Each of these friends has another child. And possibly another after that. They want newborn photos taken...and 6-month photos...and 1-year photos...but can't possibly ask me because they know how much time and effort I put into each session, yet they also know I won't accept their money. So they are stuck either not getting photos taken, or they feel like they are putting me out by asking me. They aren't "allowed" to hire another photographer because I would be offended and upset. They are my besties, afterall! They are stuck. And I put them there. So I changed my ways a few years ago and I now charge every single person that hires me. I treat them as a client and they can hire me as often as they want without feeling guilty or greedy. There are no "homie discounts" - as that too goes back to them feeling like they are allllways asking a favor, and to me feeling like my work is not respected. Do I still do extras for my besties? Absolutely. That is the joy of working for myself and having a skill that is "giftable". Perhaps it means I send them an unexpected print in the mail. Perhaps it means I create an accordion mini that I know their parents will love. I always like to do something that shows them, in turn, how much I appreciate them choosing me. I am not their default photographer, I am their chosen photographer. As someone in a profession that is reliant on being creative and fresh, I find that I must fuel the soul with shoots that have nothing to do with my "regular clients" several times a year. This can be a tough task to stomach when I am seeking a break from my camera and yet am telling myself to use it more instead. Do these sessions take time that the studio does not have? Absolutely. Does it cost us money to create the backdrops, source the props, come up with the concept? You bet. But it also gives me an opportunity to photograph something that may be a total flop or that is out of my comfort zone. Two people in our BBP family recently got puppies: Sarah who is assisting me this summer and all-around wonderful...and Erin Brennan of Brennan Brand who helps us with...well...branding! I invited them both in to do a creative shoot of their new additions. 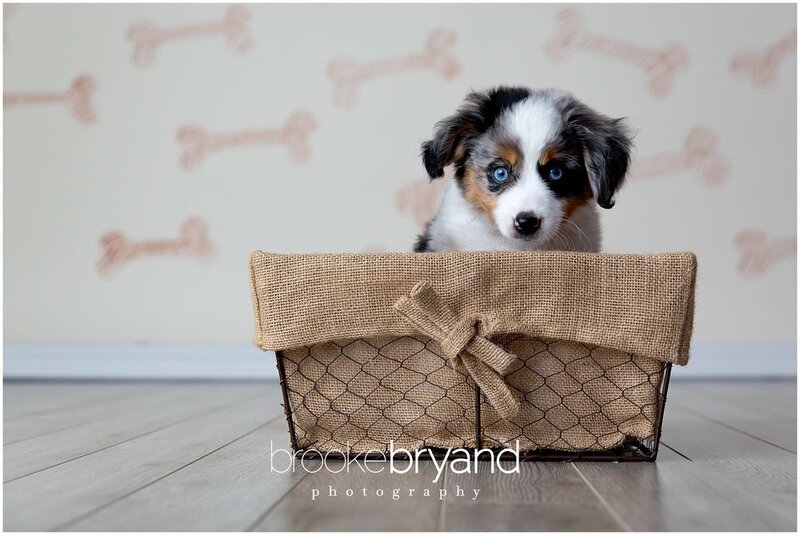 I put together a little behind-the-scenes of putting together the set, what I learned about taking photos of dogs, and of course - some of the results! If you have any questions, don't hesitate to leave a comment on Facebook or below! Haven't joined our mailing list? Sign up to receive tips like these in our almost-monthly-when-we-can newsletter! Just a quick update on the studio! After doing my test shoot, I knew I'd need to bring in artificial lights for various shoots. Today I had my first (test) newborn session using the lights and it went great! 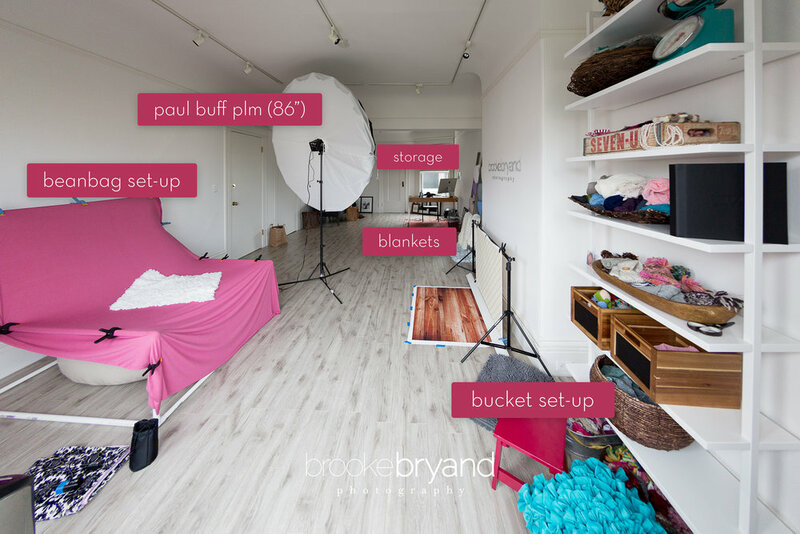 I know lots of photographers are curious what other photographer studios look like, so here is a glance into my 377 square feet of bliss. I believe there are several reasons families hire me as a photographer. One is to document their family in that particular timeframe of their lives...whether pregnant with their first child or their fifth child...whether their little boy just lost his first tooth or their little girl is going through a superhero obsession...each glimpse into a family's life is one that we'll look back on later in life with joy and a yearning to bring it back. When I moved my business to digital files in early 2013, I did so because I believe that is where our digital world is taking us. BUT - and this is a big but - the other reasons I believe clients hire me is so they can have artwork in their home that makes them smile each and every time they walk in the door. I want every family member to come home from any day...whether they just got a promotion, just got a booboo, just had an epic meltdown or just got an ice cream cone...and to see a glimpse of a photograph from a family photo session and then feel warm and fuzzy all over. I want them to glimpse at a photograph and it snap them back to that moment...that joy...that experience with their photography session. Why am I going on and on about this? Because after a meeting with a client two weeks ago, I challenged myself to print more...to enjoy more...to not let digital files "die" in my hard drive where nobody can enjoy them (including me). I printed 89 images for our home, for the grandparents, for my sister and for close friends. I actually mailed prints to our loved ones...but that's not all. I then took those images and created an album with them. I read this article a couple months ago and it has stuck with me ever since. It is referencing the author's parents' wedding album and how that is the tangible memory she can now enjoy, but it is completely applicable to our family photos as well. When your little ones grow up, do you think there is any chance they are going to comb our hard drives through 100,000 photos (which is probably conservative over 20 years) and actually look at any of them? Do you think those 100,000 photos will tell a story? I do not believe they will. I think a wonderful gift we can give our children is to create printed albums and photos for them to enjoy. They can flip through the albums to hear the stories, ask you questions, and then relive them over and over. What story are your images telling your children for generations to come? Wondering what to do to capture your little one in their Halloween costume? I have a few tips for you, either as a DIY or to grab a group of friends to hire a photographer and capture the moments for you. 1) Great light: Find a spot with indirect light falling onto your subject. You don't want the child to have to squint into the sun, nor do you want the sun behind them (where you'll have to learn all about backlight and other semi-advanced techniques!). 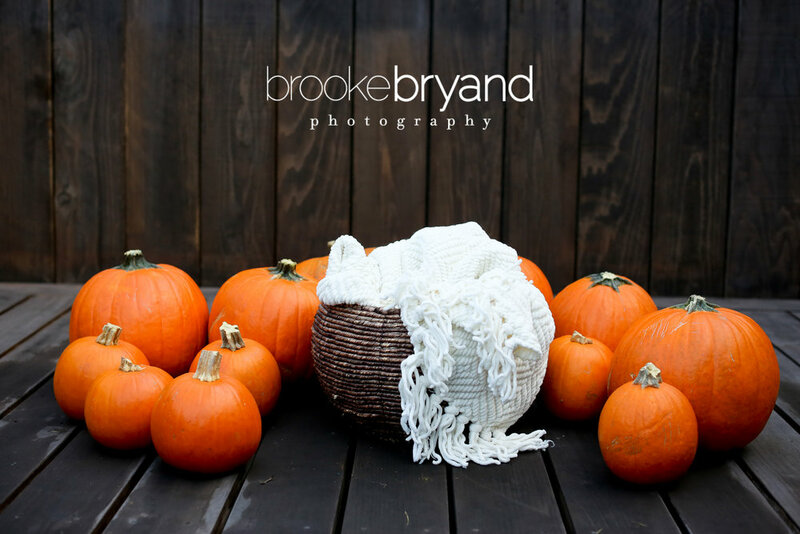 2) Festive backdrop: I went to Trader Joe's and picked up about 10 pumpkins for this session (cost: $30). I then utilized a few of my baskets for the kiddos who couldn't yet sit up, as well as an off-white blanket to use for some little tummy-time shots. My motto is always simple, simple, simple...the adorable kiddos should be the focus and your backdrop simply an accessory! 3) Patience: No need to "spray'n'pray" with your images. If you have your playgroup over, I suggest encouraging the other parents/kiddos to wait "on deck" for their turn so that the child that is being photographed isn't completely distracted by everyone else in the space. Then it is up to you to grab their attention with your silly sounds, songs, etc. and then - CLICK! 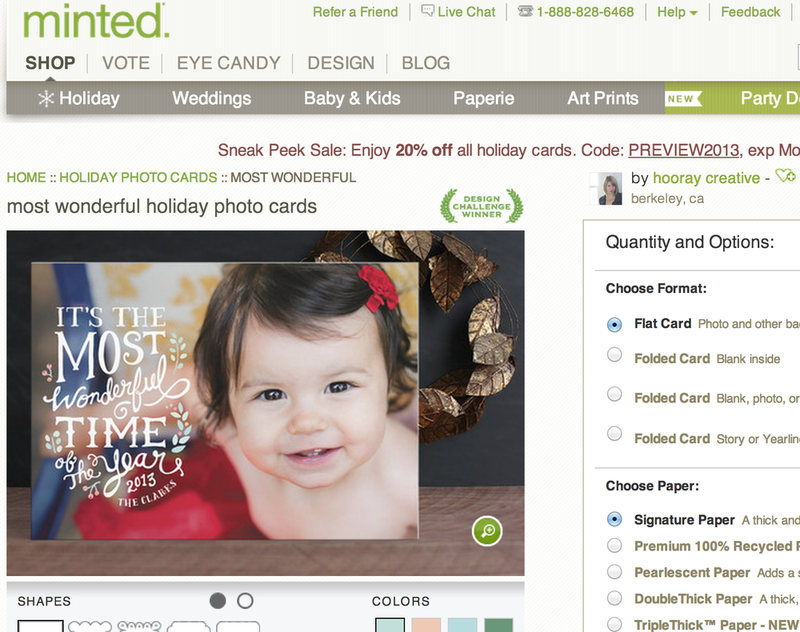 Minted contacted me a couple months ago asking if I could provide some images for their 2013 Holiday Card Collection. I was (and am) beyond flattered and honored! They launched the new card collection today and I pulled a few of the samples to share! In the age of Facebook and LinkedIn, it seems most everyone can use a professional headshot these days. From babysitters on UrbanSitter to job seekers on LinkedIn to "About Us" pages on corporate websites, conveying who we are in the form of photographs has become more and more prevalent. I'd like to share two lists with you...one on what to wear and the other on what to expect. Wear clothing that is comfortable and fitting. You do not want to see buttons "pulling" in your photos. Look at yourself in the mirror in various positions to see what your outfit will look like in photos. Be sure your clothes are properly pressed and do not wear them the whole day leading up to the shoot...change just before your session to avoid wrinkles. Choose colors that work well with your skin tone. 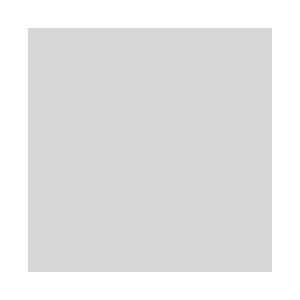 Depending on the personality you want to convey with your headshot, stick with solid colors or small checks. The general rule of thumb is if you have a light skin tone, wear colors darker than your tone. If you have a dark skin tone, wear colors that are lighter. Try to avoid blacks and whites, but instead look for other colors that can offer some personality (fuschia, deep blue, etc). Men: Typically, a long-sleeve button down shirt works well in photos for a "business casual" look. You'll want to dress up without overdressing for your career. Women: Layers are your friend! A simple necklace or small earrings are a nice touch without being overbearing. Make-up & Hair: Getting your hair make-up professionally done is worth its weight in GOLD! Not only do you feel like a rock star, but you will look your very best. Some people prefer to do their hair themselves to make sure it looks like them and that is great too - it all depends on your style. Your clothing should be professional, but it should still be you. When you meet someone in person, it should match the image conveyed on screen. Expect for me to ask you lots of questions! This helps me understand who you are and the types of portrait that would be most appropriate for your personality/career. We can then determine how formal or casual your headshots should be. I will be shooting a variety of poses and angles. Some will be sitting, some will be standing. Every person I shoot has a few angles that are more flattering than others, but until I see you and shoot you, I won't know what is best. You are hiring a professional to trust their judgement on what positions are going to bring out the best you. Try, try, try to relax as much as possible! Believe me, I know it feels awkward to be solo on the other side of the lens. Keep in mind that a) 99% of my clients are not professional models and b) I am there to make you shine! I will coach you through the entire session, giving you tips and tricks along the way...this is definitely a team event! 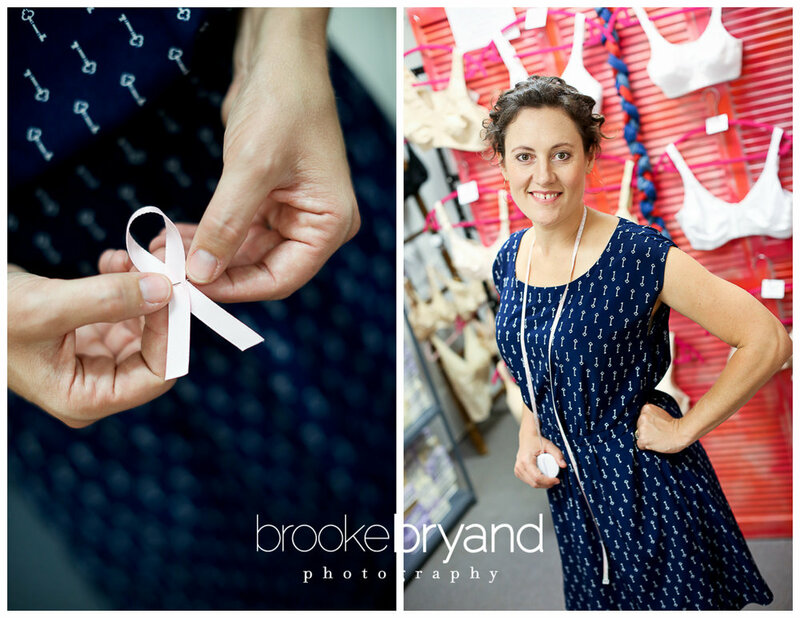 Special thank you to Loryn Barbeau for being my model! I was dropping off Cal at sharecare a few months ago and saw this awesome looking chair on the side of the road ready for the garbage. It looked like an interesting shape, but the cover definitely needed work. My mom used to reupholster our dining room chairs all...the...time. It felt like every season, she'd be painting a room or reupholstering chairs to give things a fresh look. And, on top of that, she made it look so eaaaasy! So when I hauled the chair home, I immediately showed our friend Erin who is one of those people who just says YES to projects like this. We went to Britax in Union Square and pored through the options (and options, and options, and options) until we found "the one" that would be durable, photograph well, etc. Then came the hard work. Easily enough, Cal and I spray-painted the chair blue. That part was fun. Then I attempted to look at just how one may go about putting new fabric on a chair and I immediately got stuck. Enter Erin to save-the-day...about 4-5 hours of sweat equity this week...and out came a chair that we LOVE! Is it perfect? No. But it is ours and we are proud of it. Today we brought the chairs and the kids to the woods to do a test shoot. And here....drumroll please...are the results!